Meet the B-36. Its wing span is twice the distance of the Wright Brothers’ first flight at Kittyhawk. It’s 3 times as lethal as the B-29 and can hop to any spot on earth. THE U. S. Air Force has a “Sunday punch” ready to slug any enemy who tries to start World War III with another Pearl Harbor. It’s a sleek super-dreadnaught of the skies, the Consolidated Vultee B-36 long range bomberâ€”and it’s ready today to exploit to the fullest the awesome power of the atomic bomb. Carrying its own fighter protection in its belly, it will serve, in the event of war, as the “throwing arm” for the most destructive force in history. The new air giant dwarfs even the mighty B-29 Superforts of World War II, in both size and performance. And it’s a space shrinker. It should dampen the warring ambitions of aggressive nations anywhere in the world. “From the North American continent, they can strike anywhere in the world where aggression against us could start. The B-36 has a four-section bomb-bay whose total space equals that of four railroad freight cars. It can fly 8,000 miles at nearly 400 mph with a bomb load of five tons â€”and fly home. For closer targets it carries 36 tons of blockbusters. In terms of a fighting army, the huge craft can carry 400 fully armed men to any battlefield on earth. The extent to which the new atom-bomber outclasses even its vaunted predecessor, the B-29, is most obvious in a physical comparison. Its fuselage, for example, is two-thirds longer than that of the World War II Superfortâ€”163 feet compared to 99 feet. The B-36’s 230-foot wing span is almost twice that of the B-29â€”nearly double the length of the Wright Brothers’ first flight. The basic weight of the B-29 is 78,000 pounds; the B-36, 130,000 pounds. On one flight, the B-36 took off with a gross load of 278,000 pounds (139 tons), the heaviest load ever lifted from the earth by an aircraft. The giant wing of the B-36, swept back along the leading edge, covers an area of almost 5,000 square feet. Six pusher-type Pratt and Whitney engines, mounted along the trailing edge, develop a total of 18,000 hp. The B-36 is equipped also with the largest propellers ever installed on an aircraftâ€”19 feet from tip to tip. Thermal anti-icing is provided for cold weather, high-altitude flying. A reversible pitch mechanism makes short landing runs possible despite the bomber’s massive size. A simple control throws the propeller blades in “reverse” and they act as “air brakes.” It is uncanny to see this monster plane land, come to a quick, smooth stop, then back up the runway to a taxi strip. The takeoff, too, is something to watch. Starting down the runway smoothly and easily, the mighty bomber takes on a slow-motion-movie appearance as it finally becomes airborne. Its takeoff run is 5,000 feet over a 50-foot obstacle. The nose of the B-36, which normally carries a crew of 12 with a four-man relief unit, is equal in size to ten average living rooms. Fighter protection for the AAF’s new atom bomber, a big target for advanced attacking techniques such as proximity fuses and guided missiles, is not the problem it seems. Its service ceiling of 40,000 feet places it beyond the range of anti-aircraft fire or efficient fighter attack. Still the atom bomber must be prepared to defend itself. For this, its engineers have several answers. In addition to eight gun turrets, each equipped with two 20-mm cannon electronically sighted and fired at an enemy attacker, the B-36 has another advantage. To attack a bomber successfully, a fighter must be capable of a speed at least 25 per cent greater than that of its quarry. The atom bomber’s speed of nearly 400 mph, then, runs an attacking fighter squarely into the compressibility problem. The fighter has to reach at least 500 mph if it is to fly rings around its target. Now a fighter’s maneuverability decreases as its speed increases, to say nothing of the added physical burden on the pilot under such circumstances. These two factors help protect the B-36, since an attacking plane is yet to be devised that can engage in aerial combat at such a speed. Jet fighters have exceeded a speed of 500 mph in level flight, but there is no indication that maneuverability in combat, even in these planes, can approach the high level of efficiency required at such speeds. The B-36’s ace-in-the-hole, however, is a startling innovation in military air scienceâ€” the “parasite fighter.” Each of the mighty bombers will be capable of carrying in its bomb-bay section three tiny jet-powered fighters, to be released against the enemy if “things get hot.” These bantam fighters, XP-85’s built by the McDonnell Aircraft Corporation of St. Louis, are vest pocket versions of the same company’s famous jet-propelled Banshee Navy fighters now in production. Although the “parasite fighter” will have a comparatively limited range, it will have the advantage of going into combat with a full fuel tank as the B-36 disgorges it in flight. With all this multiple protection, the massiveness of the B-36, ostensibly a handicap since it offers a large target area, will in no way impair its efficiency as a fighting machine. Its very existence, in fact, may prove a psychological deterrent to war. Coupled with the United States’ possession of the atomic bomb, the AAF’s new power of instant and devastating atomic retaliation should make a potential enemy think twice before he starts throwing his weight around. Didn’t tests prove it nearly impossibe to recover the parasite fighters? The pilots weren’t officially Kamikazees were they? I’m looking forward to the comments from the aviation fans. Yeah, the whole parasite fighter thing didn’t work that well. The combination of a tiny fighter with a short wingspan and horizontal stabilizer set close to the wing made it somewhat unstable. Trying to fly such a plane near a giant bomber and all the turbulence the bomber created was difficult and dangerous. The program was abandoned and never implemented operationally. The B-36 could also carry a conventional jet fighter semi-externally. This worked better. These were even used to conduct secret (and illegal) reconnaissance flights over the Soviet Union – the B-36 would carry the fighter near the Soviet border and then the fighter would make a dash over Soviet territory and take pictures. The fighter would then rendezvous with the B-36 which would carry it back to the US. The first free flight came on August 28, 1948. The test pilot detached his XF-85 from the EB-29B and flew free for 15 minutes while he evaluated the handling properties of the new fighter. However, when it came time to re-hook, he ran into trouble. The XF-85 was caught in violent air turbulence underneath the parent aircraft. After ten minutes of futile attempts to hook onto the trapeze, the XF-85 was slammed up against the trapeze and the canopy was shattered. Fortunately, the pilot was uninjured and he managed to make an emergency landing on the dry lake bed below. Following repairs, 46-524 made three flights on October 14 and 15 of 1948. Three successful recoveries were made, although each one of them was a rather harrowing experience for all concerned. However, on the fifth flight, more trouble was encountered. 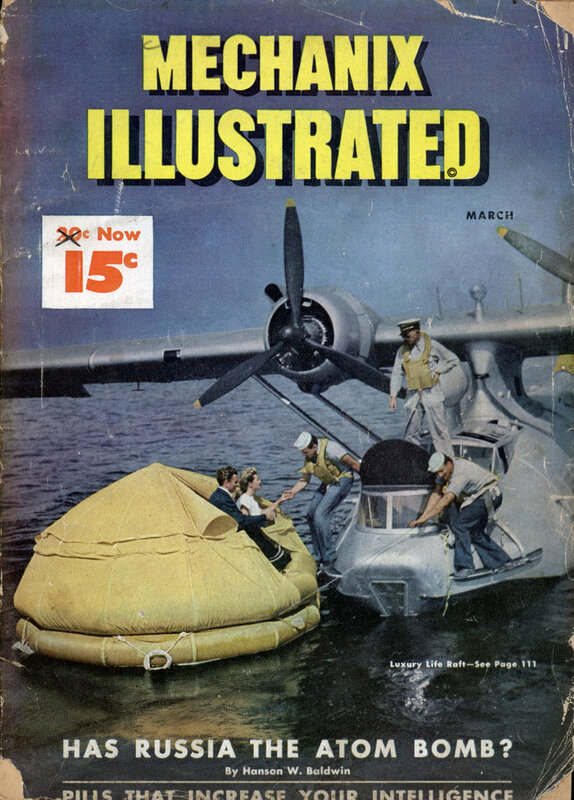 The removal of the temporary fairing around the base of the hook resulted in severe turbulence and loss of directional stability, forcing the pilot to make another emergency landing. Vertical surfaces were added to the wingtips in an attempt to improve directional stability while flying in the turbulent air underneath the EB-29B. However, this did not help very much, and the sixth XF-85 flight ended in yet another emergency landing on the lakebed. The same fate awaited 46-523 on April 8, 1949, when it made its first and only flight. In spite of the problems encountered with recovery, the XF-85 handled quite well in ordinary flight. Here is the fact sheet on the XF-85 Goblin. On another note, it’s interesting that they mention the “compressibility” problem (sound barrier) as a defense. 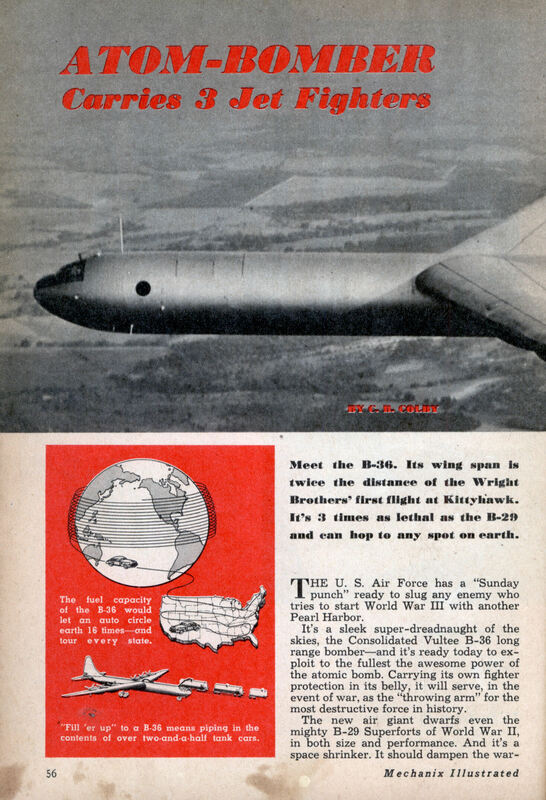 The author definitely gives the impression that the B-36 would carry a full bomb load and three fighters as well. I especially liked the breathless reference to carrying 400 soldiers. I’m sure the Strategic Air Command and Curtis LeMay would have loved to sigh up for that mission with their new bomber. More accurately, there was actually a cargo plane prototype built on the B-36 airframe; the XC-99 http://www.visi.com/~jw… and yes, it would carry 400 soldiers. With the advent of jet transports, the economics of commercial air travel were much improved, so the ’60s finally saw a boom in air travel. This led to the 747, the first passenger plane with greater capacity than the XC-99.